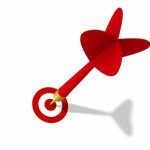 Develop Targeted Software | RivCom Inc. When appropriate, we can develop mini software applications that make your workflows more efficient. The tools we use enable us to deliver a useful business application in just a few days or weeks. The challenge is to know when custom software will be a cost-effective solution. Typically the best opportunity is when you can leverage your existing systems while adding critical missing functionality. The goal: Reduce the amount of time spent recording each new job while improving the quality of the information in the system. What we did: Developed a “Job Intake Form” that supplements our client’s existing system while providing new levels of real-time support and data validation. The result: A 10-fold reduction in the time spent keying in new jobs and elimination of almost all data entry errors. Maxons Restorations is a leading disaster recovery service that provides property restoration services for homes and businesses. Maxons makes extensive use of customized screens and fields in its Goldmine CRM system to track each restoration project that it undertakes. Information about the project is stored as a “contact” record in Goldmine, and referral relationships connect the project to all of the different parties who will be involved. Calendar entries and alarms alert internal managers that a new job has arrived, and there are a number of other customizations which allow Maxons to use Goldmine as the focal point of its project management workflow. Most jobs come into Maxons as a phone call. Until recently, information about each new job was written on paper during the intake call, then keyed into Goldmine afterward. Contact details for all of the parties were then extracted and copied to the paper form, which was attached to the project folder as an “at a glance” reference. Simply keying all of this information into Goldmine could take ten or fifteen minutes and introduced opportunities for error. The challenge for Mark Iocolano and Tony Stewart was to streamline this data entry process and ensure the accuracy of the information that went into the database. 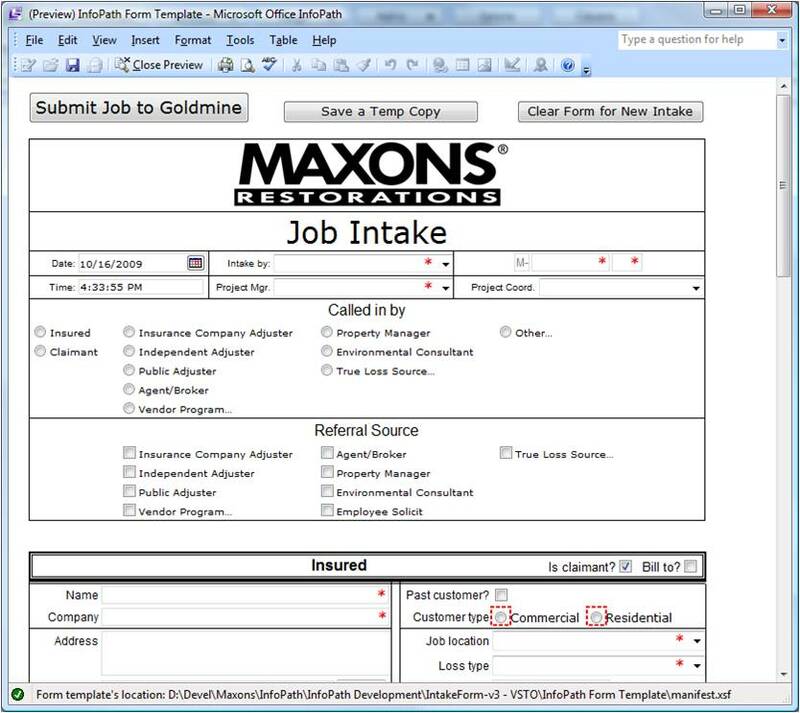 Using Microsoft Infopath and Visual Studio, we created a new Job Intake Form in which Maxons employees can record information about each new job in real time while on the phone with the customer. This form is optimized for quick entry during the call, and it connects to the Goldmine database so that it can provide real-time assistance and guidance. For example, when the insurance adjuster’s name is entered, the form checks whether that person is already on file and pulls up his contact details automatically. Numerous other hand-holding and validation routines ensure that the data which goes into the form is accurate and complete. Once the call is over, a single click “submits” the job to Goldmine. The Intake Form causes Goldmine to create a new job record and sets up all the referral relationships, notes and calendar entries in just a few seconds. It then prints itself out in an easy-to-read format for attachment to the job folder. The entire operation only takes a minute longer than the phone call itself. This dramatically speeds up the intake process and also guarantees that all of the data has been properly entered into the system.